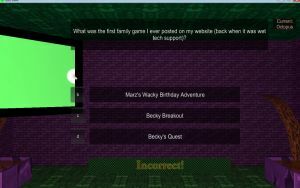 Quiz Game Show is a customizable game show where you can write your own questions and challenge your friends to trivia. It is highly recommended you read the manual before hosting a show. Don't worry, it's a very short manual and a lot of the content is pictures.